No matter your DIY craft experience, this is a no-fail, no-stress way to brighten a day, a room, or a life! Ever notice how sometimes the simplest gestures can mean so much to just about anyone? People light up with joy! Well, today’s DIY craft is one of those simple gift ideas that is sooo beyond easy, quick, and one that you can’t mess up. It makes for a thoughtful gift to give for almost any occasion AND it works great for those last-minute times too. It’s almost too easy, and that’s the beauty of it too: you can make it at a moment’s notice and will be able to fully bask in celebrating the occasion. of course, you could use seashells you found instead! Put the sand into the bottom of the lantern. Put the candle in the middle. 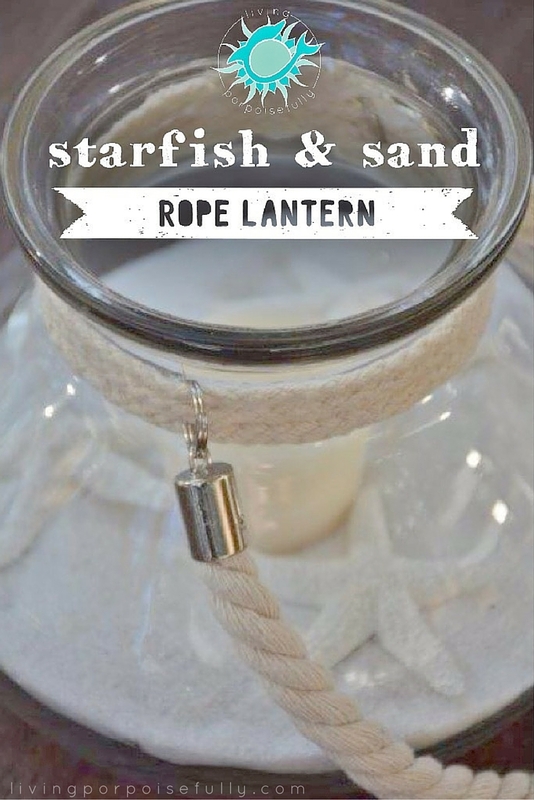 Place the starfish (or seashells) how you want them around the candle. See? Almost too easy, but to see the special someone who receives it as a gift simply light up with joy, you’d think it took hours! And who wouldn’t love the warm beachy vibes? With it being so easy to make, why not make one to light up your own house too. We certainly did! After I read your posts, I always come away with “It is so simple and beautiful! Why didn’t I think of that?” Thank you. Oh thank you so much for this, so happy you feel that way!